Despite Cavendish's headlinable sucess on the Tour (and shortly at the Olympics), along with medal winning from the British Cycling team at the worlds (and shortly at the Olympics..) cycling doesn't the mainstream press coverage it deserves in the UK. That's probably something do do with it being UK sportspeople competing in a non-football event. 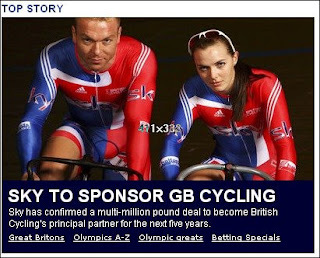 As of today, Sky became the 'Principal Partner' for British cycling, from Olympics to the grass roots in all disiplines. Sky is also sponsoring the London "Freewheel' event on September 21st- a mass ride from 38,000 people on closed roads in the centre of London. Media sponsorship is good news when seen against the wider scene of Sustrans connect2 scheme providing high profile cycing facilities, ongoing resurgence of the Tour of Britain (in London 7th September), infrstructure building in Cycle Demonstration Towns and a stack of other activities going on. "Every level of the sport is set to benefit from the investment, from the Elite Team of World, Olympic and Paralympic cyclists to British Cycling’s talent development programmes and grass-roots initiatives in schools and local communities. The partnership will cover all forms of the competitive sport from BMX to track cycling and road racing, with the aim of bringing on the elite teams and accelerating the development of emerging talent. The partnership also aims to build on Britain’s love of cycling with participation programmes in schools, youth clubs and the wider community to encourage everyone to get cycling. 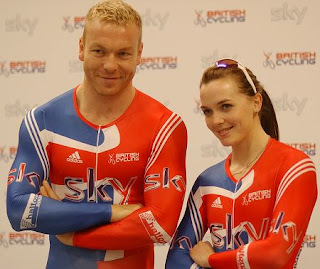 In addition to its financial investment, Sky will use its marketing expertise and relationships with one in three families across the UK to help British Cycling to encourage participation in cycling for sport and leisure among people of all ages and abilities. "